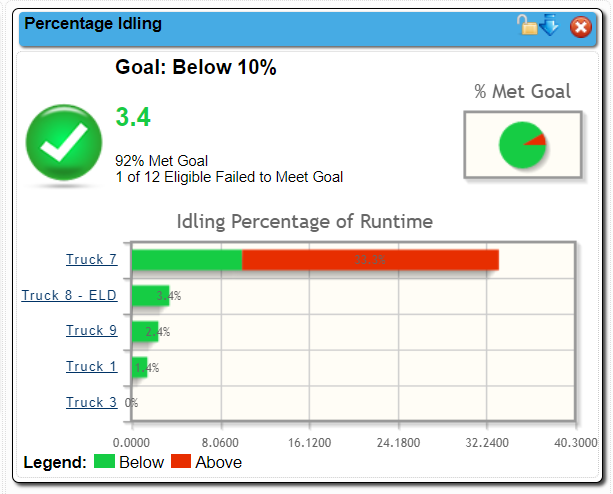 The Advanced dashboard consists of a series of widgets. The first set of widgets that are initially loaded onto your software platform function as placeholders and can be replaced with the widgets of your choosing. To delete a widget, simply click on the red X in the upper right hand corner. Widgets can also be dragged and dropped, allowing you to customize the layout of the page. Click on the Lock icon in the upper right hand corner will freeze the widget in place, so that it cannot be moved until unlocked. Widgets can be added using the Add Widgets link. You can input your own Name for the widget, then select the widget Type and the Report Type (the data you want the widget to use). Select Add Widget to save. If you run out of room for Widgets, you can add another tab by selecting Add Dashboard.You can then use the new tab to build more widgets. The dashboards are a per User setting; each individual user can build their own widgets, which will not effect what the other users see. 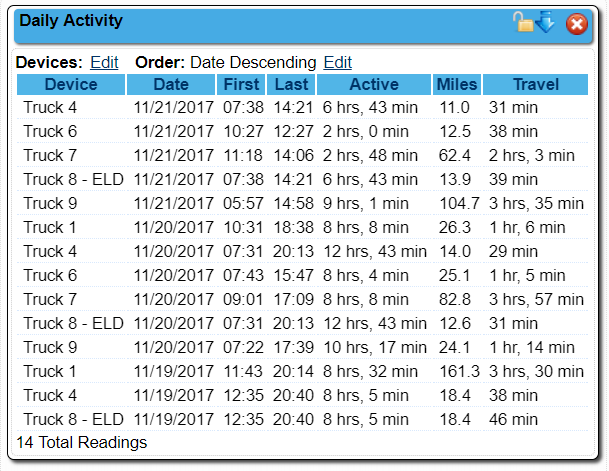 Use the link marked Settings to change which units and drivers are displayed on the widgets, along with the date range of data to use. 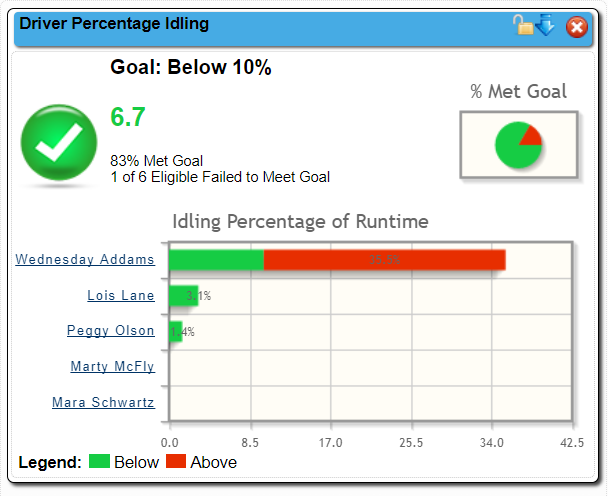 This is also where you can input the goals needed for the Average widgets. Be sure to hit “Refresh Reports and “Done” to save the changes. The widget will let you see a list of the selected events within the date rage specified. The example below is listing Trips. This widget provides a list of triggered Alerts for the date range specified. It’s a version of the Notifications report. A list of all Maintenance tasks within the date range, both open and closed. A smaller version of the map on the Locations tab. Allows the User to see their vehicle locations while within the Dashboard. 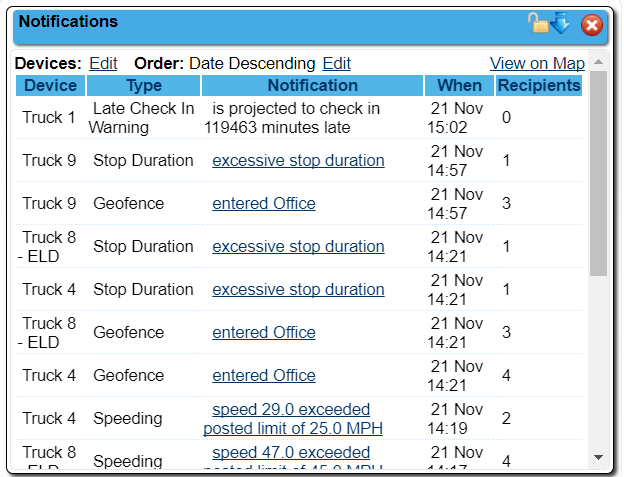 The widget will let you see a list of the selected events within the date rage specified for a Driver instead of a Device. The example below is listing Trips. 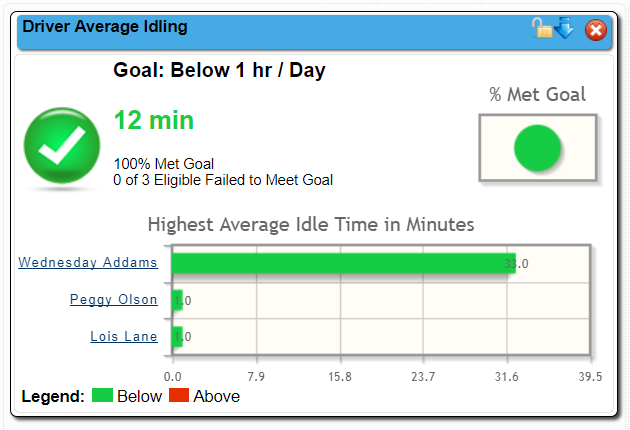 A very basic widget that allows the User to see a quick comparison between Drivers regarding the behavior item chosen (this example is looking at Idle time). This widget is only going to show data for devices that pulling Sensor Data from the vehicle. The widget will list each unit along with their mileage, fuel usage, mpg and idle time for the date range selected. A very basic widget that allows the User to see a quick comparison between Devices regarding the behavior item chosen (this example is looking at Idle time).